Every month, the Youth We Can! afterworks give voice to committed and passionate young people for them to share their stories and their vision. The purpose of these afterworks? Create a spark for those who do not dare to commit yet and help them to take action! On the 10th of April, Youth We Can! Organised a meeting on the topic of the protection of the environment and the fight against climate change. The REFEDD (French Network of Students for Sustainable Development) was one of the projects that got under the spotlights that day. Introduced by Julie Alanno –its delegate general– the REFEDD is a network of student associations that lead projects related to sustainable development. This includes projects on food, biodiversity, climate, or waste management. The REFEDD mobilises and sensitises young people to sustainable development through various activities and events. It offers conferences and afterworks in many places in France. The REFEDD’s flagship event for the past three years is RENEDD (the National Students Meeting for Sustainable Development), a weekend during which all the associations in the network meet to share their experiences. As delegate general, Julie has been involved in the coordination and organisation of the network’s projects, thus exercising many responsibilities. This allowed her to grow her skills and make her experience in the community very rewarding and educational. Presented by Sinda Matmati, its director, with Julie Mouret and Albane de la Fayolle, two volunteers, AHTARAME is an association that encourages citizens to take action for the protection of the environment in their city. Sinda’s community involvement began when traveling to Tunisia, her home country, shortly after the Arab Spring. She was marked by the fact that the political and social revolution that had just taken place did not take climatic and environmental issues into account. She therefore decided to create her own association for the protection of the environment, in Paris. In particular, AHTARAME offers awareness raising workshops on climate issues run by volunteers. Despite the difficulties in developing the organisation, in particular with respects to the lack of financial resources, she now aims to export her project to the Maghreb countries. 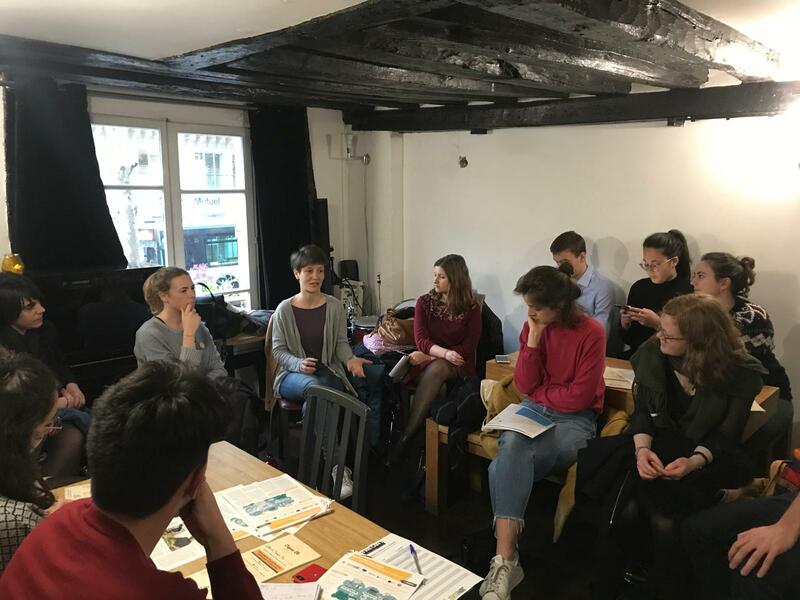 CliMates, an international laboratory of ideas and actions, bringing together volunteers, students and young professionals around climate issues, was presented by its chairwoman, Olivia Saxer. CliMates’ goal is to create innovative tools in order to train young people to become agents of change and to influence decision-makers. Olivia presented the advocacy, mobilisation and research activities of CliMates whose ambition is to act both in France and at the international level. Indeed, some of their projects are taken over autonomously in some countries. This is the case of their “COP in my city” project, which aims to simulate COPs thanks to a computer tool capable of calculating, in real time, the impact of a decision on the environment. Today CliMates’ projects are spreading around the world, especially in Africa. It is proof of the effectiveness of their advocacy activity to shape good practices. Julie is the delegate general of REFEDD, a network of more than 130 students’ associations committed to act for sustainable development. Sinda, Julie and Albane are members of AHTARAME, an association offering awareness raising activities and concrete actions for city-dwellers to reconnect with nature. Olivia is CliMates’ chaiwoman. CliMates an international laboratory of ideas and actions, bringing together volunteers, students and young professionals around climate issues. Subscribe to the Youth We Can! newsletter or follow us on social media!